I am a minister and a storyteller. I believe that we all carry sacred stories within us that are ours alone, and that we carry the sacred stories of great people as well as our sacred scriptures. I believe these stories shape us, and help us to act in ways that help the arc of our moral universe bend toward justice. In the United States of America, the third Monday in January is the day set aside to celebrate and honor Rev. Dr. Martin Luther King Jr. It is not his birthday, it is not the day he died – it is just an ordinary Monday. (Well, except when there is an inauguration of a president.) And what is more fitting or more honoring than to look at the principles that he lived his life by, daily, and what could be more fitting than to consider living our lives by those principles as well? 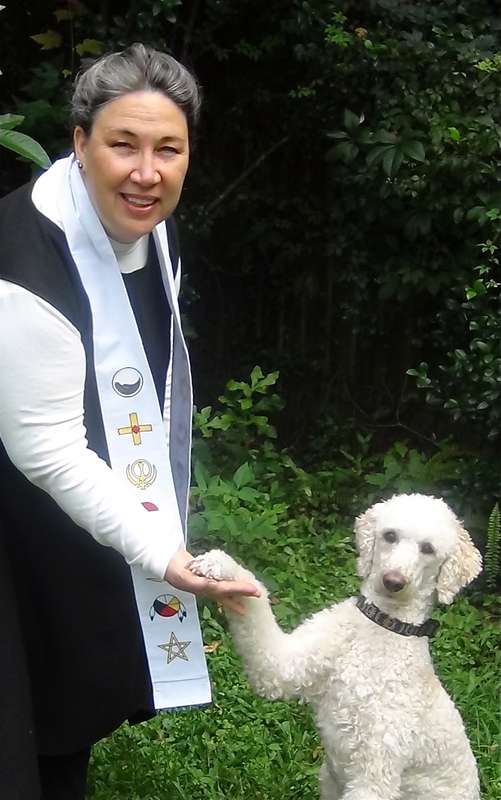 In his first book, Stride Toward Freedom, Rev. Dr. King outlines the fundamental tenets of nonviolence. These have been handily compiled by the Martin Luther King, Jr. Center for Non-violent Social Change – now simply called the King Center. The are also on MLKday.gov – but please choose the center for more complete information. The Beloved Community is the framework for the future. Attack forces of evil, not persons doing evil. Accept suffering without retaliation for the sake of the cause to achieve the goal. So I went looking and listening for a story to honor justice and nonviolence. History repeats itself – and we have many lessons of the effectiveness of non-violence as a means of social change – some we are very familiar with, but the core of the story has been shifted for different reasons and agendas over time. So often does this happen, in fact, that we forget that it is non-violence that wins the race, non-violence is the tortoise of our history. Sometimes, the story has shifted so much that we can’t even see the essential message or core that makes it a sacred story. Sacred stories speak universal truths. Sacred stories last because something in their very core speaks to our very core – and they contain questions we need to be continuously mindful of asking. So I went listening for a sacred story of non-violence and I heard the howling of a wolf. Really? I was reading stories from the march to Selma, and of Mohandas Gandhi before be was Mahatma, and still the wolf was calling to me. At first I thought of the two wolves that live in all of us, and wondered which one was this that was crying out – the aggressive, jealous, angry one or the loving, compassionate one. But the howls continued, and I realized I needed to simply stop and listen. So I did. And this is the story I heard. It is an old story, but a historic one, told by many people to many other people, until it was written down around 1390. It takes place in a small village in Italy called Gubbio around the year 1209. The wolf was in every way the Big Bad WOLF – eating sheep, and goats — and in one version of the story he even ate a whole cow. and in one version, even eating them. Before there was this wolf, there were a lot of wolves, but the townspeople and the shepherds and the cowherds were successful in chasing them all away. Or, truth be told, in some cases trapping and killing them, for they were EVIL, you know – everybody knew that wolves were evil. And so it was even more proof that this one wolf was even more evil than all the others, for it stayed. Which, of course, brought out the town guards, but no sooner had they raised their bows and arrows than the wolf sprang on them. Killing the first one who raised his bow and shot his arrow, the wolf grabbed the other man’s leg – but only got his shoe and the man was free. The wolf limped back into the woods, and the man limped back to the village. The very next day, Giovanni Francesco di Bernardone walked into town. (Well, in some versions of this story the townspeople come to where he was living and asked him to come.) But either way, he arrived at the village of Gubbio. He sat down with the villagers and listened very carefully to all their tales of the wolves, and this wolf in particular. But Giovanni Francesco went anyway. Suddenly, the wolf is there, right in the middle of the path. And the wolf prowls around Francesco, and Francesco, he just stands there. In some stories, he makes the sign of the cross toward the wolf. In early versions, he crosses himself. But in both, he just stands there. And then the wolf just stands there, looking. And then Francesco sits down. And then the wolf sits down. And tells Francesco his story. And some say it looked like the wolf prayed too, but I can not speak to that – for who can tell what is a prayer to another, simply by looking? I can say that Francesco did not throw a rock at the wolf. He told the wolf how scared the people were, the wolf told of how scared she was. She promised that if the people would feed her, she would stop preying on their sheep and goats and cows. And if they stopped trying to kill her, she would stop trying to kill them. Some say this is because the wolf saw that humans were made in God’s image, but I do not know that – I think she just saw the divine love before her in that moment. And they both recognized each other as brothers. As in monks. As in members of a beloved community. For it is said that then they each reached out to the other, hand placed in paw, or paw placed in hand – heart to heart. And so it was that Francesco and the wolf walked back to the village. By the time they reached the fountain in the center of town, the whole village was there — astonished at the site of the peaceful wolf, astonished at the sight of the man peacefully beside her. And the people saw the wolf was lame, and she saw they were scared. And everyone was sorry. And everyone told their stories. And everyone received forgiveness. And so it was that every morning and every evening she would go from house to house and they would share their food, and she would guard the town all night. And it was that way until she died, in the natural way, of the natural wearing-out causes. It is said that Francesco even made an agreement with and for the town dogs – If they would respect the wolf, the wolf would respect them – and so it was that the dogs got to be outside in the day, but got to sleep inside their homes at night. Peace is Good. I believe Rev. Dr. King would agree. I know I do. Together we can heal the world. This entry was posted in Stories for all ages and tagged gubbio, Jr., love, MLK day, non-violence, religion, Rev. Dr. Martin Luther KIng, salvation, social justice, spirituality, St. Francis, theology, wolf. Bookmark the permalink.